We have a lot of interesting usernames on the website. There is Fudgy McPoo, Snackshack, Blaqkcap and my personal favourite Drunken Alchemist just to name a few. I remember welcoming Subterfuge to his first break on the site mistakenly as Subterfudge. So why FIVE 7s Mr.Golfnut?? And what's the meaning behind the often pronounced 198977, Shawn? And then there's the apparent blue jeans enthusiast Wrangler Nation. I'll start: In high school I was known almost exclusively as "TK", even the teachers didn't use Tyler or even Ty. From TK there were many derivitives, and during my tree planting career I was "Teeks" (many of my closest tree planting buddies will admit that they didn't even know my real name after 3 seasons... it is a strange and mysterious world when you're in the bush for 2 months at a time). I suppose this was around the time when I signed up on eBay so I used Teeks. As for the 643, up until 2 years ago I was obsessed with baseball (and as many of you know, 6-4-3 is the offical scoring for a SS-2B-1B double play). I played hardball, coached the High School team, as well as watched probably 150 out of 162 Jays games in the season (one year I also travelled to 11 games in Kansas City, Chicago and Seattle). After my son was born I did not have the time to follow both Baseball and Hockey, so unfortunately ball had to take a back seat to the Leafs and now the Jets as well. Do I wish that my box breaking name was a little cooler? Perhaps. But after I started a few breaks on eBay and developed a reputation there really was no option to change. So for those of you wondering why a prominantly hockey Box Breaking website goes by "643" there you have it. My name is from my old Counter-Strike gaming days, and I thought it was a great match for my playing style. Subterfuge means a plan or action to hide what you’re doing. I guess my name is pretty simple. I play hockey and I'm a goalie in a local men's league. 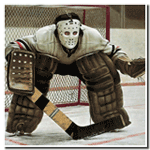 40 was the first real number I had besides the default 1 that all generic goalie jerseys are. Actually the orange jersey I use in my videos is that jersey. I do play wing also but I change my number to 44 then. I do that because one year we printed the jerseys wrong and 40 wasnt made I'm usually the big guy in front of the other teams goalie getting cross-checked in the back because they can't move me. I used to use 76 for everything because that was my old football number back in the day. Well, my name isn't going to be very interesting compared to the others. Obviously, I needed a sign-on for "evil ebay". So I just took my name and added 198977 to it. 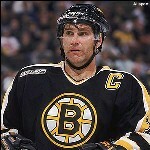 1989 is my graduating year from High School and 77 is reference to my favorite Bruin Ray Bourque. See, I told you! Very boring. Had I known that I should pick a name that I'd be called by, I would have been more creative. But when Ty and the whole 643boxbreaks crew decided to part ways with ebay, I figured I should stick to my Ebay name to make breaks easier on everyone. Last edited by Golfnut77777 on 2012-May-Thu-08-05, edited 1 time in total. Interesting topic. I have been curious about the long list of 7's for a while now. I got my first computer in 2000 and I was signing up for a message board. My favorite band of all time is Living Sacrifice. I have listened to them for 20+ years. I was listening to my favorite album of theirs on my computer at the time (stackthepads40 had just sent me an email about these mp3 things) which is titled Reborn. The name "reborn" was taken so I went to the first track of the CD which was Reborn Empowered. I preferred Reborn M. Powered but most message boards don't like spaces. I have been using it since and it is rare enough that I have never had to pick a different username unless it was something I had already signed up for and forgotten about. It works out well because it is absolutely my favorite song of all time. I love the lyrics and I love how brutal the music is. Shawn198977 wrote: Had I known that I should pick a name that I'd be called by, I would have been more creative. But when Ty and the whole 643boxbreaks crew decided to part ways with ebay, I figured I should stick to my Ebay name to make breaks easier on everyone. Golfnut77777 wrote: I really want to know why Keith goes by Oceans? Maryann (my fiance) calls him either Danny or George Clooney because of that name (among other names like my boyfriend...but that is a whole nother story). Funny you mention this. My wife Stefanie has often referred to my "box breaking boyfriends" because of how much I talked about them, especially at the beginning. Now I have learned to limit the discussion to only the biggest of hits or monumentous ocassions to spare myself from the impending eye roll. It feels kind of funny sometimes talking out loud and using usernames like "Golfnut" or the most awkward "Fudgy McPoo." Jerry and I try and use real names as much as possible when talking in the staff room at school, haha. This is a great topic and I can't believe I just saw it now! Mine's not too terribly exciting. My nickname is Buck amongst all my friends and when I was in college, I was (and still am) a big fan of the band Man...or Astro-Man. My friend Cory took to calling me Buck...Or Astro-Buck and when I got my first dialup account waaaay back in 1995, I used astrobuck as my username. I have found there is one other guy out on the interwebs that uses astrobuck, but he appears to be really, really, really into the old Buck Rogers show from the early 80's.